Hello! I know I said I would post these yesterday, but I have been so consumed with trying to figure out where to send my soon to be kindergartener to school next year! Unfortunately we are not zoned for a very good school : ( We didn't think it was a big deal because we thought we would be out of this house by the time Avery was starting elementary school, but we also didn't know that the housing market would crash and burn like it has! Soooo here we are and I have been doing a ton of research trying to weigh our options. I will probably continue to be stressed for the next 2-3 months until we figure it out! Anywho...I have a couple more cards to show you that I posted for the Verve release week challenges. This first one was a color challenge to use Gray, Black, and Turquoise. Awesome color combo, huh? I used this fabulous set called Thankful Accents and the dp is My Mind's Eye Andrea Victoria. Come back tomorrow to check out the new Your Next Stamp Challenge and to see my YNS creation, then on Thursday we will show off the new releases with the Your Next Stamp Blog Hop!!! There is still time to enter the Blinkie Contest. See THIS POST for the deets! You had me at VERVE! Fabulous designs and creations, Kerri! LOVE the color combo and detailing! 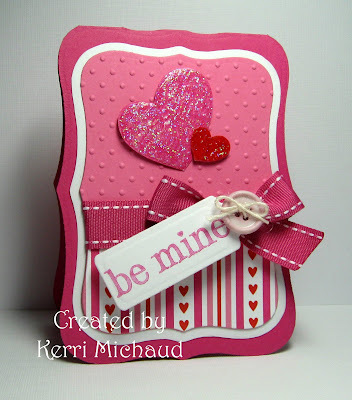 The sparkly hearts and sentiment tag along with shape card are wonderful! I love that gray, black and turquoise. It is a fabulous combination. Oh, so pretty! And I love the shimmery hearts, too. WOWZA GF I LOVE these VERVE images...yikes they are beautiful!!! I have to tell you the first color combo is a stunner!!!! LOVE both of your creations!! hugs! I know exactly what you're going through, we bought the first house (pre-kids) not even thinking about school and had to bite the bullet and moved to a better school zone three years ago. Good luck with your search! Ohhh school stuff...and housing stuff...YUCK. Hope you all can figure things out soo so that you aren't worrying or doing too much work trying to make it all happen over the summer. That black and white card is HOT! With the little pop of blue - very cool. I like your little label taggie on the Valentine card - - that's a fun stamp. OOOOOH la la! These are totally Verve-alicious!!! LOVE both of these Kerri!!! Oh my goodness....both these cards ROCK!!! Sorry to hear about your school problems, wishing you the best! Both of these are so pretty. Your Valentine card is adorable. These are both gorgeous Kerri but the first one is my favorite!! Wow!! I love the dp and those colors. Incredible! Your shaped card is stunning too. Love the tag and all the hearts!! Such lovely cards! Good luck with the school situation. OMG, Kerri you always have the cutest textures on your cards. The blue and black combo card is so cool. The black made the blue stand out so well! And your 2nd one is just as stunning...great papers, colors and I love the shape of it...I've GOT to get me some Nesties! Wish you good luck and best results in resolving this situation! Everything will be all right, Kerri! It just take time. Love, love you cards! Stunning! Really like the colors and dimension of the first one! And what a sweet sparkly hearts on the second! Oh Kerri! So not fun trying to figure out the school situation. I can't decide if I'm just going to put my son in public preschool or pay to send him to a much better preschool a couple of blocks away. It's hard! Your cards are fabulous! I love how you added the little rhinestones to the dp on the fabulous gray, bl, turq! yummy combo!! And your sweet paper combos and glitterfied hearts are so fun!